Eastern Wyoming College students recently traveled to Gillette to compete in the State SkillsUSA competition. EWC earned 6-State Champion awards and won Top Chapter in state. In Chapter Business Procedure a team of six individuals take a 100 question written exam concerning parliamentary law and then perform a mock meeting and conduct business utilizing intricate parliamentary motions. The individuals who earned first place on EWC’s team were Thomas Garvie, sophomore, Torrington, WY; Kyle Sabourin, sophomore, Farson, WY; Nate Foster, sophomore, Sutherland, NE; Bryce Funk, sophomore, Merino, CO; Alyssa Barnsdale, sophomore, Lusk, WY and Shelby Cranston, sophomore, Moorcroft, WY. The next gold medal EWC won was in Customer Service. The following EWC students participated. Shelby Cranston who took first, Ashley Nash, sophomore, Torrington, WY with the silver medal, 3rd place winner Nicole Smith, and 4th place was Riley McDonald, sophomore, Torrington, WY. In Customer Service individuals participate in a written exam and participate in a mock customer service scenario. Participants in the Prepared Speech contest in SkillsUSA gave a speech on the topic “Champions at work” which was this year’s theme for SkillsUSA. Individuals must show how SkillsUSA is helping build champions for today’s society through the training, contests, and opportunities they offer. EWC students placed in the following order- Paul Michael Cole, sophomore, Torrington, WY earned first place in this event, Jacob Preston, sophomore, Hawk Springs, WY placed second, and Ashley Nash placed third. The last competition that EWC earned gold in was extemporaneous speaking. In this contest individuals were given five minutes to prepare a three-to-five minute speech on a randomly assigned topic. Contestants are judged on voice, mechanics, platform, deportment/movement, organization and effectiveness. Kyle Sabourin placed first in the event and Thomas Garvie followed with the second place medal. EWC Welding Team 1 won the Gold medal for 1st place and the honor of representing EWC at the national level in Louisville, KY in June. The teams built a smoker/bar-b-q that will be auctioned off at the Rocky Mountain Elk Foundation Banquet. Part of the proceeds come back to the chapters that built the smokers. The students also have to take a written test on their knowledge of welding. Bartton Spracklen, sophomore, Torrington, WY was high individual and awarded a new welder for his success. Individual welders that placed at the SkillsUSA Conference were, Aaron Wadhams, sophomore, Mitchell, NE placed 2nd; Bartton Spracklen, 3rd place; Kevin Austin, sophomore, Torrington, WY placed 6th; Eric Cantu, sophomore, Lyman, NE placed 7th; and Jakaia Blackman, sophomore, Indianola, IA placed 13th. SkillsUSA is an opportunity for individuals to challenge themselves in a vast variety of contests. EWC’s students proved that they were more than ready to face the challenge in prepared speech, extemporaneous speaking, business procedure, and customer service. These student brought home the gold for EWC and the high chapter trophy placing EWC on the map of success once again. Dr. Michelle Landa, EWC’s appointment to Vice President for Academic Services who will begin in July. Eastern Wyoming College has announced that Dr. Michelle Landa has been hired as the Vice President for Academic Services. Dr. Landa will begin in July. Her EdD in Organizational Leadership from Argosy University was earned in 2012, a Master of Art from Seton Hall University in 2006 in Strategic Communication & Leadership and a Bachelor of Art from California State University, Bakersfield in Communication. Dr. Landa taught Communication and Speech courses from 2005 through 2012 at Taft College, Bakersfield College and College of Western Idaho. More recently, she is currently serving as the Director of Institutional Effectiveness at Treasure Valley Community College in Ontario, OR where she has also served as the Director of Institutional Research. Landa also served as the Director of Institutional Research at College of Western Idaho from 2010-2012. At Brown Mackie College, she was the Dean of Instruction, Student Services and Institutional Effectiveness from 2008-2010. Dr. Landa also has professional consulting experience. Since 2003 she has been the principle consultant for Effectual Business Services, LLC which offers services in curriculum development, accreditation consulting, technology solutions, strategic planning as well as facilitation and professional development services. “We are very pleased and excited to have Dr. Landa join us at EWC. She brings a great deal of experience and knowledge to the position and appears to be a very good fit for our community. We trust that she will continue to lead our academic services as Dr. Ludwig has so ably done,” added Dr. Patterson, EWC President. Dr. Landa will replace Dr. Dee Ludwig who is retiring after a 27 year career at the College. Dr. Ludwig first joined EWC in the classroom and then moved into academic leadership roles where she was instrumental in the development of the Outreach areas for the College, distance education and capital construction. Ellen Creagar (center) receiving her award with EWC Instructional Technologists David Banville (left), and Aaron Bahmer (right). Eastern Wyoming College instructor Ellen Creagar has received the Master Distance Educator Award at a recent Wyoming Distance Education Consortium conference. Creagar is in her nineteenth year as an Instructor of Social Sciences and Business Law at EWC. Prior to moving to Torrington, she was a practicing attorney in Denver, Colorado after clerking for a Denver District Court Judge. She earned her Bachelor of Arts degree from Wellesley College, her JD from the University of Colorado-Boulder School of Law, and in 2010, earned a Master of Arts in Teaching History from the University of Wyoming. At EWC, Ellen teaches History, American Studies, Public Speaking, Political Science, Ethics, and Business Law. The Community Education department at Eastern Wyoming College in Torrington is still accepting registrations for an upcoming trip, Singin’ in the Rain, Candlelight Dinner Theatre. This trip is Saturday, May 30. The bus will leave from the EWC parking lot at 9 am and return at 7 pm. The cost of $65 includes meal, beverage and tip. Hilarious situations, snappy dialogue, song and dance, a hit parade score, an onstage rainstorm and of course a delicious meal are all included in this dinner theatre trip. Singin’ in the Rain is perfect entertainment for any fan of the golden age of movie musicals. Call or stop by EWC Community Education to reserve your spot today at 307.532.8213 or 307.532.8323 or 3200 West C Street in Torrington. The registration deadline for this trip is May 22. Julie Sherbeyn, Head Volleyball coach and Michele Ogburn, Director of Counseling and Disabilities clean out a planter along Main Street. Eastern Wyoming College held its first Lancer Project which was a community service project on April 30, in downtown Torrington. EWC staff, faculty and students cleaned out and spruced up all the planters along Main Street. “We wanted to show our appreciation to the Goshen County voters for their support for the General Obligation Bonds last year,” said Michele Ogburn, project manager and director for Counseling and Disabilities at EWC. 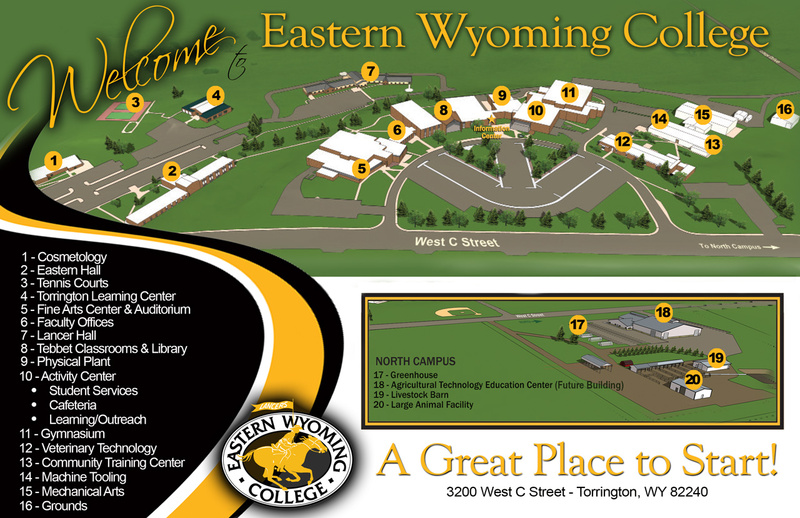 Eastern Wyoming College has announced that a registration event will be held for Goshen County students on June 2, 2015 at the main campus in Torrington. Students will meet with an advisor and register for the Fall 2015 semester. Students are encouraged to sign up early for the pre-registration session. To sign up, call Marisol Chavez at 307.532.8230 or visit the EWC website at ewc.wy.edu to sign up online. Registration for the Summer 2015 session is also currently open. A complete schedule is available online at ewc.wy.edu. Eastern Wyoming College recently held a reception to recognize and honor employees for their years of service to the College. President Dr. Rick Patterson, Dr. Dee Ludwig, Mr. Mike Durfee, and Mr. Ron Laher each spoke to congratulate and thank each person for the contributions they have made to the College. Those employees who will be retiring from the College this year were also recognized. Retirees include Dr. Dee Ludwig, 27 years; Dr. Lorna Pehl, 26 years; Oliver Sundby, 7 years; and Muriel de Ganahl, 4 years. Receiving recognition for 30 years of service to the College was Holly Branham; 25 years, Terri Hauf, and Dr. Peggy Knittel; 20 years, Bob Creagar; 15 years, Tami Afdahl, Andy Espinoza, JR Gutierrez, and Dr. Monte Stokes; 10 years, Lori Moore, Tracy Rodgers, and Patricia Velazquez. The Eastern Wyoming College March for Babies Team kicked off their first annual fundraising event. Torrington March for Babies was held on Friday, May 1. The EWC March for Babies Team was a collaboration between EWC student groups, Torrington High School FBLA, and Lingle/Fort Laramie High School FBLA. “With all of the support and generous donations, our newly founded Eastern Wyoming March for Babies Team was able to raise almost $1,600 to help the Wyoming Chapter of the March of Dimes. Approximately forty faculty, staff, students and community members gathered on a beautiful afternoon, for the Torrington March for Babies,” shared Julie Sherbeyn, EWC Head Volleyball coach, and event organizer. The March of Dimes is a national organization that raises money to give hope to nearly half a million babies born too soon each year. All of the money raised will go to the Wyoming Chapter of the March of Dimes in Casper to support programs right here in Wyoming that help moms have healthy, full-term pregnancies. Money raised by March of Dimes Volunteers also funds research to find answers to the problems that threaten our babies. Eastern Wyoming College Instructors, Rick Vonburg and Dr. Monte Stokes received Honorary State FFA Degree awards at the 88th annual Wyoming FFA Convention held recently in Cheyenne, WY. Rick Vonburg is a past member and Wyoming FFA State Officer. He is instrumental in building a positive relationship between Wyoming FFA and Eastern Wyoming College with his help hosting the Veterinary Science Career Development event and providing scholarships and sponsorships to Wyoming FFA members. Dr. Monte Stokes has been instrumental in developing and implementing the Wyoming FFA Veterinary Science Career Development Event. As an instructor at EWC, Dr. Stokes is always looking for a way to involve and develop Wyoming FFA members and all young people in the areas of veterinary science and agriculture. Eastern Wyoming College Student Senate officers and members presented Dr. Dee Ludwig, Vice President for Learning with a plaque at one of their April Meetings. The students wanted to recognize Dr. Ludwig for her outstanding service to the student body at EWC, her support of each student and for enriching students’ lives.